Blazar neutrinos – Physics says what? I’ve written elsewhere about neutrinos (aka “ghost particles”). The latest news is about a particular discovery — a major team effort — as to the source of some of the most energetic ones. Many articles. Some contain illustrations. Most of these neutrinos come from the sun. But a small percentage, which boast extremely high energies, have rocketed to our neck of the woods from very deep space. The inherent elusiveness of neutrinos has prevented astronomers from pinning down the origin of such cosmic wanderers — until now. Scientists have spotted a high-energy, incredibly tiny “ghost” particle called a neutrino flying through Antarctic ice and traced its origins back to a specific blazar, they announced today, July 12. The IceCube Laboratory at the Amundsen-Scott South Pole Station in Antarctica is the world’s largest neutrino detector. Its computers collect raw data on neutrino activity from sensors in the ice that look for light emitted when neutrinos strike. This illustration shows how muon neutrinos can arrive at the IceCube detector via different paths through the Earth. Neutrinos with higher energies and with incoming directions closer to the North Pole are more likely to interact with matter on their way through Earth. A blazar accelerates protons (the yellow p) to the energy levels of cosmic rays, initiating a complex quantum cascade that also releases gamma rays (magenta) and neutrinos (blue), which follow straight paths through space. The coupled detection of these two particles [“multimessenger” emission] enabled astronomers to identify the blazar as a source of cosmic rays. 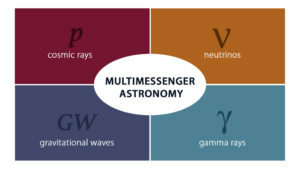 Multimessenger astronomy involves synthesizing information from multiple sources. 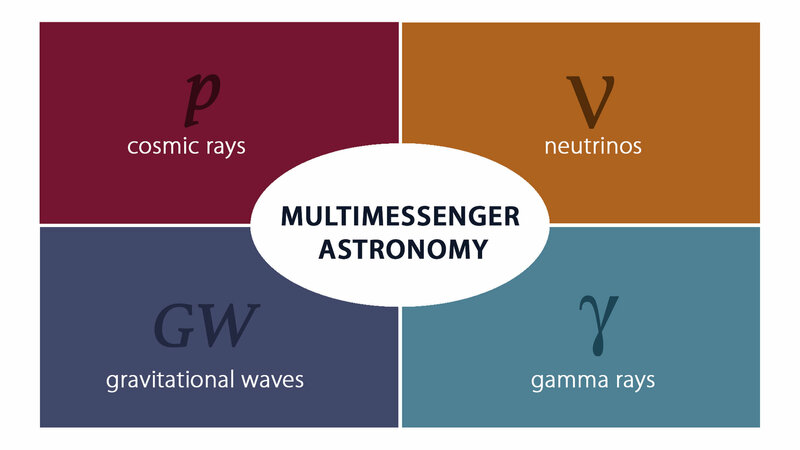 Astronomers can currently gather data from these four messengers. Here, gamma rays stand in for the entire electromagnetic spectrum, which spans radio waves, through optical light, to gamma rays. Space.com: “Fermi Telescope: Studying the High-Energy Cosmos” (July 16, 2018). Fermi is designed to examine gamma-ray radiation, the most energetic form of light that there is. Like the visible light that humans can see, gamma-rays are on the spectrum of electromagnetic radiation. Gamma-rays, however, have billions of times more energy than visible light.